The highly successful Accelerated Study in Associate Programs (ASAP), developed by the City University of New York, has been shown to nearly double graduation rates after three years. This brief presents results after two years from a replication of ASAP at three community colleges in Ohio. In 2014, Lorain County Community College launched Students Accelerating in Learning (SAIL), a comprehensive student success program that is substantially improving persistence and graduation rates among low-income students. This brief describes the steps Lorain took to fund and institutionalize SAIL that are now making it easier to sustain the program. On May 7, Alex Mayer discussed the challenge of developmental education for low-income college students in New Jersey and nationwide, citing recent innovations and growing evidence about what works to overcome barriers to college success. The strongest programs integrate several strategies, combining opportunity and obligation to address multiple student barriers. MDRC has developed a body of rigorous evidence on interventions designed to help low-income college students succeed. This issue brief draws six lessons from that work for colleges and policymakers as they seek to improve college completion rates. On February 6, Alex Mayer, MDRC’s Deputy Director of Postsecondary Education, explained to members of two California State Assembly committees that combining and integrating evidence-based strategies to address multiple factors can be highly effective in improving completion rates among low-income college students. 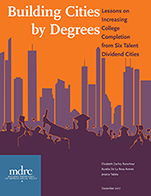 The Talent Dividend competition encouraged major metro areas to find ways to boost their proportions of college graduates. The effort suggests that cross-sector partnerships and interventions that ease students’ transitions to the next level of education hold promise in aiding credit attainment and narrowing achievement gaps between groups of students.